I have a few tracks “in the can” already, but from the work I have done on the project so far, I feel I would like to improve the sound I’m getting when I record my acoustic guitars. The “gold standard” for a guitar sound, as far as I am concerned, is Phil Keaggy‘s seminal 1991 album “Beyond Nature”, which matches some superlative playing with a sumptuously full and rich acoustic guitar tone. As the album’s engineer (“jb”) modestly observed in an interview, a lot of the “secret” to the album’s sound is down to an outstanding guitarist playing handbuilt instruments costing thousands of dollars, but he did reveal that he used multiple microphones and pickups on the guitar, and basically blended them until they sounded “right”. Well, I don’t have anywhere near the budget for jb’s mikes (the two Sanken CU-41‘s he mentions would set me back about $7000 for starters), but I figured it was time to expand my options in the mike department. Until now, I have relied on one of my two Oktava MK219 condensers, placed within about 10-15cm of the guitar and pointing at the neck/body join, and more recently I have started recording the output from the guitar’s transducer pickup at the same time, to increase my options at mixing time. The results are, to my ears, “tolerable”—the 12-string guitars on this early mix of “The road to the cove” (one of the “in-the-can” album tracks), were recorded with the above one-mike-and-pickup setup—but the guitar still sounds “boxy” and distant to me, whereas I’d like it to feel as if you’re right in front of the instrument. Enough preamble: what to do on the mike front? 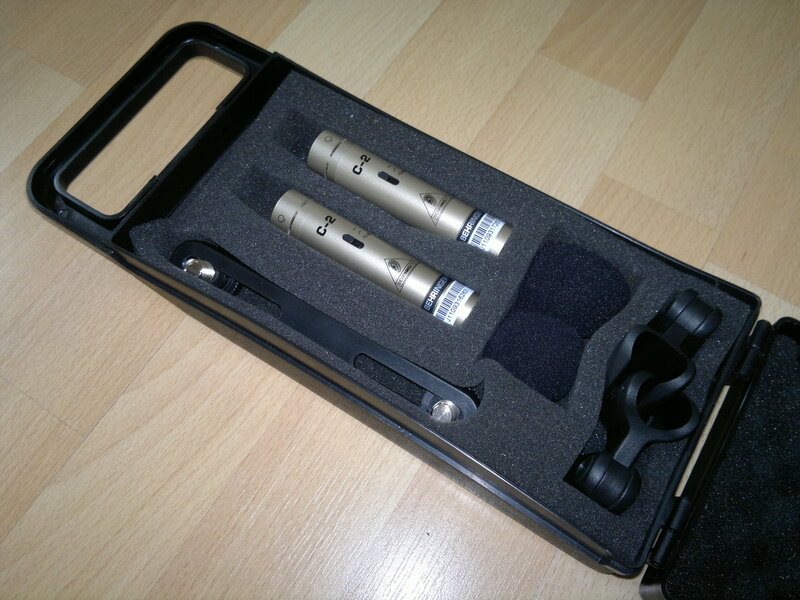 After some reading-up and weighing-up (and consideration of my next-to-zero budget), I decided to invest in a Behringer C2 stereo condenser mike set. They took an eternity to come into stock (apparently Behringer recently switched their UK distributor), but I finally took delivery of the set this week. The C2s come in a matched stereo pair, bundled with a bunch of accessories in a plastic carrying case. 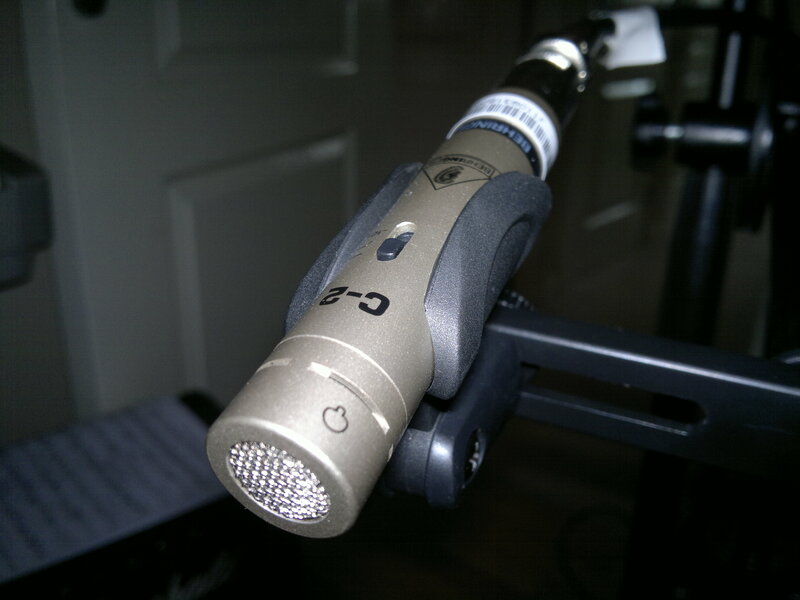 The mikes themselves are “pencil”-type, small-bodied condensers—they certainly are small (barely the length of my index finger, and almost exactly the diameter of an XLR cable connector), but feel quite robust, being metal-bodied and with gold-plated XLR connectors. The accessories are a pair of foam windshields, a pair of screw-on mike-stand clips and a stereo mounting bar. At least one review half-joked that the Behringer C2 set was worth buying almost for the accessories alone—certainly, I’ve seen a similar stereo mounting bar selling for about 60% the price of this whole package—but others have pointed out that the mikes themselves offer amazing value for what one is paying for here. I look forward to testing these little fellows in the studio, and will post a clip or two on my Soundcloud page of the results (assuming they come out reasonably). I’ll also be posting bits and pieces to Soundcloud—demos, sketches, works in progress, etc.—as I make my way through this recording project, and if all goes well, I plan to finish the album and “release” (whatever form that may take) it by the end of 2011.